I thought it was about time that I gave my thoughts on felting. I've done quite a bit over the years, both intentionally and unintentionally! I once felted half my hand-knit sock collection in one easy move by setting the washing machine to an ordinary wash not a hand wash. Now, I always wash socks by hand! Accidents apart, whilst writing my felted slipper patterns, and since for gifts for friends and family, I've probably felted more slippers than any sane person would want to in a lifetime. I've decided to split the subject into two. This, the first part is all about the yarn and the tension/gauge of your knitting. 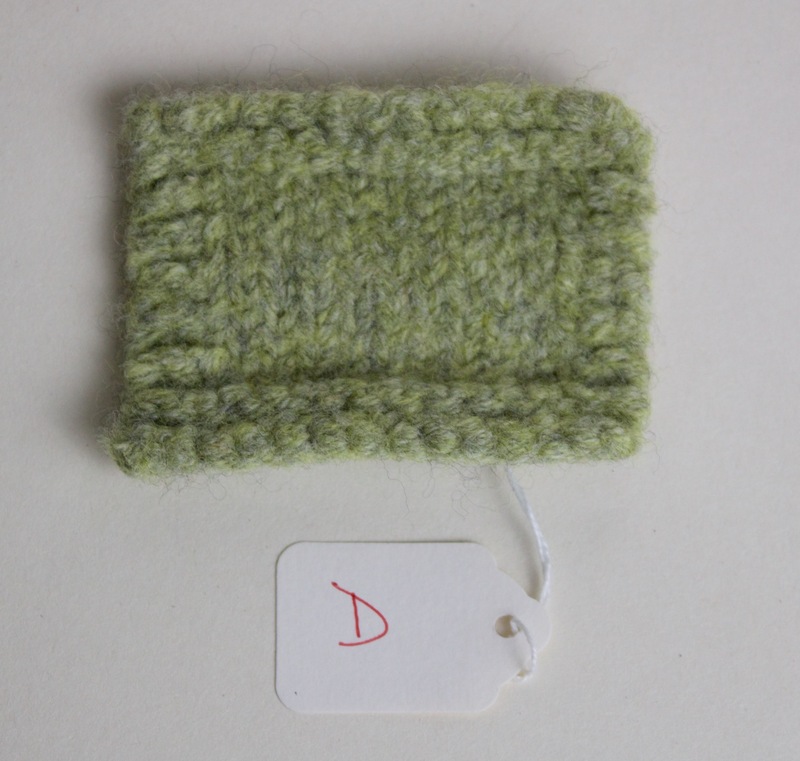 The second will be about exactly how to go about felting your knitting and the differing results you can get. Some yarns will felt more that you ever thought possible. Some will resist so much you start to wonder if you've actually used a super wash yarn by mistake. There is one exception to this rule you should always bear in mind though - if you don't want an item to shrink and felt, it will! Even those yarns you struggle to get to felt into a pair of slippers will still felt enough to make that sweater, at the least a bit stiff and at worst, un-wearable. Yarns sold specifically for felting will, as they are supposed to, felt well. I started off my felting odyssey using these types of yarns and they do work very well although I did find some of them rather 'hairy' once felted. When writing the slipper patterns I also found them a little less consistent with regard to how much they felted each time. This is not a problem if you are felting an item such as a bag, but I wanted the slippers to have, as much as possible, a consistent amount of 'shrinkage' among them so I could size them as accurately as possible. I also wanted something that was perhaps sturdier and easily sourced. For my samples I switched to Cascade 220. It is easily accessible and comes in a large colour palette (which at the time of writing this is about 150 different shades). I found that it felted well and gave pretty consistent results. I have used other yarns with very good results, Elann and Drops Yarns make some very good worsted weight non super wash wools in lovely colours but the list is pretty endless really. My personal preference for felting yarns are 100% wool yarns that are plied, i.e. have two or more strands twisted together. I find them nice to knit with and stable in the felting process. They also don't shed an awful lot of fibre into your machine in which can happen if you choose to felt with a singles (one continuous twisted strand, un-plied) yarn. 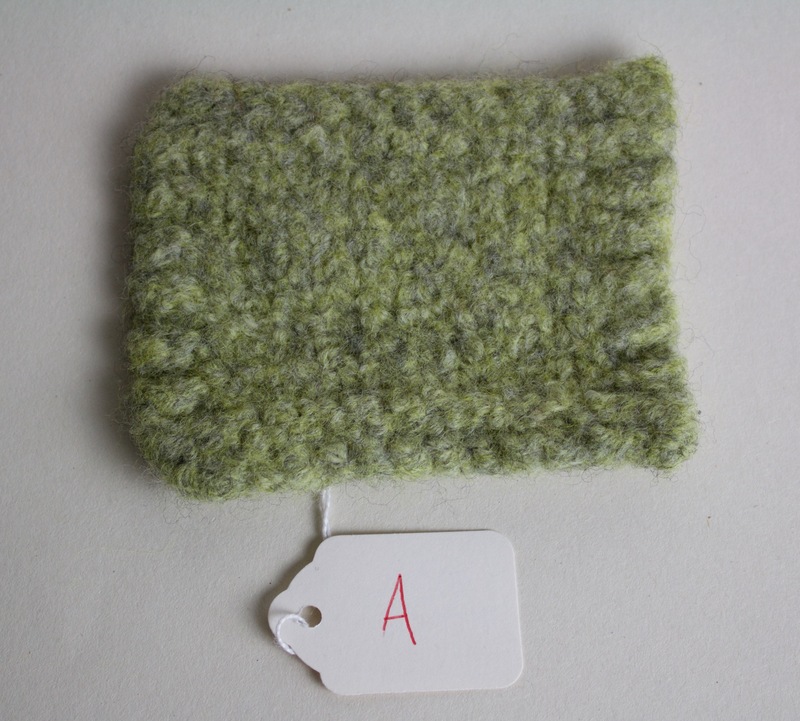 Some people prefer their felted items to loose all stitch definition and just look, well, like felt. Some, and I probably fall into this category, prefer a little of the stitches to show. I couldn't tell you why exactly, it may be something to do with it still looking hand made or knitted. Whatever your preference there is a yarn out there for you - experiment is the key. These are just my opinion and preference. There are many, many yarns that are good for felting. Don't feel confined to use any specific one. Try your favourite yarn, or one that you have in stash. Just make sure that it is non-superwash and be prepared to experiment, you could get some very interesting results. If you have never tried a particular yarn, or have done some felting with one yarn and want to switch to another, make a swatch and felt it. I know most of us hate doing it, but it does give you a good idea as to the final fabric you will get, how much it will felt (don't forget to measure it before you felt it) and what it will look like. It all adds to your knowledge of that yarn before you start your project and takes a little of the mystery out of the process. No need to put the washing machine on just for one tiny swatch. Just throw it in with a wash that you happen to be putting on anyway and see what happens. At the end, you don't only have a little sample of your end product but felted swatches make great coasters! Before you say it, I know that having the same amount of stitches knitted at different tensions gave me two samples of different sizes. But for all of the samples I knitted for this piece on felting (there are more in part 2 ) I measured before and after and calculated a percentage decrease in size. So effectively the starting size does not particularly matter here. Besides, to get the two to exactly the same starting size I would have had to knit a swatch to work out the gauge before actually knitting the swatch. And knitting a swatch to be able to knit a ... swatch... was just beyond my limit at the time! This first sample; Sample A, was knitted at the standard tension/gauge for the slippers, 3 sts per 2.5 cm/1 inch on 8 mm/US11 needles. The yarn was held double, just as it is in the slippers. I knitted 14 sts x 14 rows and it measured 115 mm x 100 mm or 4 ½" x 4" before felting. Sample D below was knitted exactly the same but I changed down to 6mm needles. The sample measured 95 mm x 82 mm or 3¾" x 3¼" before felting. It was put together with sample A and felted. Well, I hope that this has given you a few tips about felting yarns and gauge. In part two, I will get into the kitty-gritty of throwing your slippers into the machine. The differences that you can expect and what to do if things don't go as planned.